Follow our extensive Dynaway EAM Guide to learn more about EAM functionalities, add-ons and see how the modules works by watching demo videos. 1. 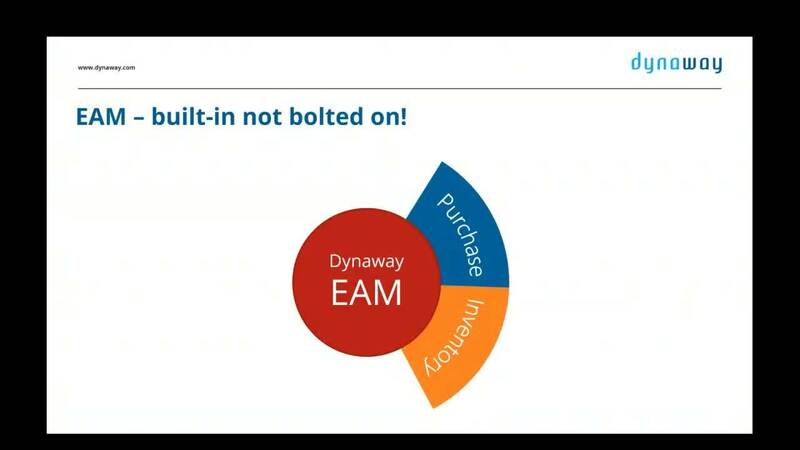 What is Dynaway EAM? Enterprise Asset Management (EAM) is an advanced module for managing assets and maintenance jobs in Microsoft Dynamics® 365 for Finance Operations. 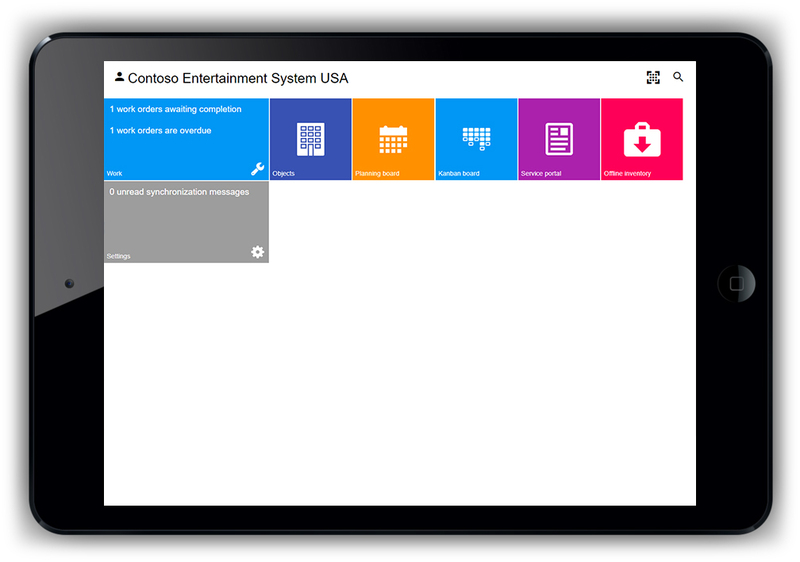 Enterprise Asset Management integrates seamlessly with several modules in Microsoft Dynamics® 365 for Finance and Operations. Dynaway EAM (link: What is EAM) helps you efficiently plan and execute tasks related to the maintenance and servicing your company’s assets. The set of features included within Dynaway EAM enables your machinery and equipment to work continuously without unnecessary interruptions or breakdowns. When you log in, you will be able to see a list of different workspaces. On the left side menu, you can see the preview of the different modules available based on your predefined role on the ERP. The EAM module is structured the same way as the other modules which exist on Microsoft Dynamics 365 Finance and Operations. Corrective maintenance is carried out after failure detection and is aimed at restoring an asset to a condition in which it can perform its intended function. Work order can be directly created from service requests, created via the Service Portal on our Mobile Client. Via Dynaway EAM you can set up values of different asset properties which can be tracked and based on their values, reactive work-orders can be automatically created. Preventive maintenance is proactive maintenance that is performed regularly at predetermined intervals in order to prevent asset failure. This can be achieved by creating maintenance sequences on Dynaway EAM. With Dynaway EAM is possible to predict future maintenance tasks, based on data provided from the assets. 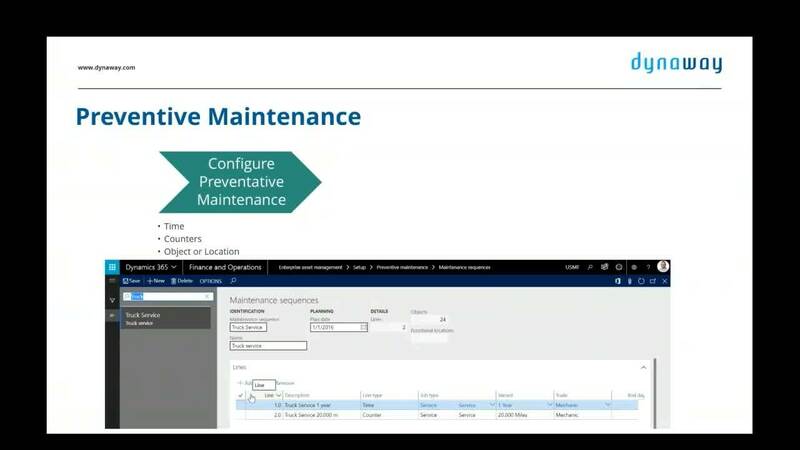 Instead of doing preventive maintenance based on time, it can be predicted based on usage. Based on asset properties and maintenance planning, work order can be created automatically or get an overview of larger period and plan before creating the work orders. In Dynaway EAM, an object is a machine or a piece of equipment that requires continuous maintenance and service. Objects can be created in a hierarchical structure. Maintenance jobs can be planned at all levels in the object structure. So that a work order to be created, there should be stated an object which requires certain maintenance. Therefore, the central parts of Dynaway Asset Management are objects and work orders. The core functionality of Dynaway EAM is the work order creation and execution. The work orders are staged-based processes which can be adjusted based on company’s operations. How can work order be created? Create from object calendar, based on maintenance sequences, request or rounds. Create from All Requests list page. Dynaway Mobile Client is a comprehensive offline capable client that supports a very wide variety of processes related to work order execution.The Mobile Client is a webapp. The Mobile Client can be accessed via any browser, which gives you flexibility with the devices you would want to use the Mobile Client on. 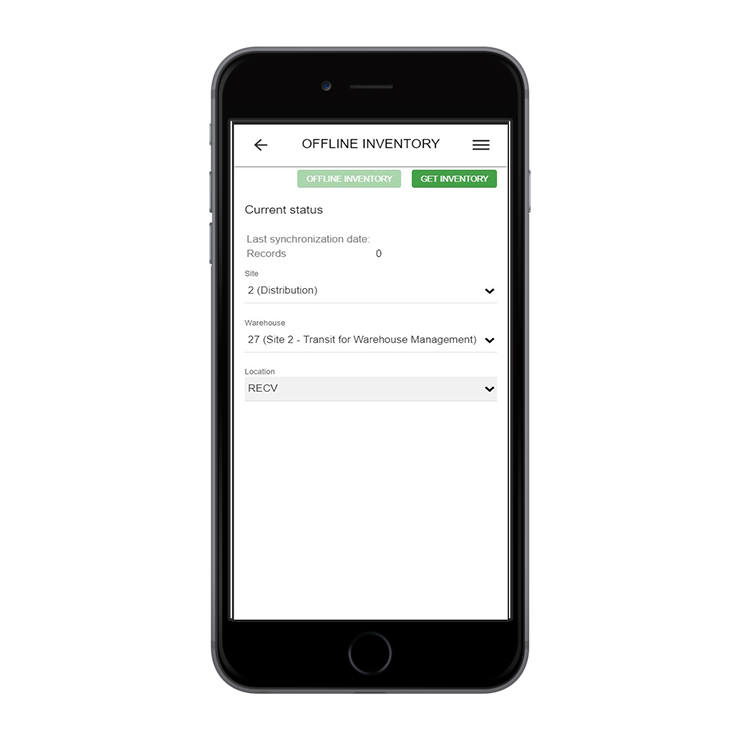 On the Mobile Client, a worker can see which tasks have been scheduled for the day or check the task overview for the week or the month. By clicking on the work order, the worker can see the description of the task which can be added manually or a checklist attached to the task which needs to be executed. The worker can get a full overview about the object maintenance history before executing a task and check requests, created for this object, which the worker can resolve. Attachments can be added by the worker for documenting a work. For example, a picture can be added to show the result or the progress of a task. Guidelines can also be added to a task, if needed. After the execution the worker can register the hours spent on the task and the used spare part consumption. When the Mobile Client is online, you can request item information, allowing you to see inventory status and create item registrations when the Mobile Client is offline. You can use offline item information to create item forecasts and item registrations. This is useful if you work on maintenance jobs in remote areas with limited or no internet coverage. The offline inventory can be used in a remote warehouse or as a stock list in your service van. When the Mobile Client is online, select Offline inventory in the main menu. On the Offline inventory screen, select a Site as a minimum. If required, select Warehouse and Location. Select the Get inventory button to download the inventory from the selected inventory location. Now, you can create item consumption registrations from the offline inventory. When the Mobile Client is online again, item consumption registrations are automatically transferred to Dynamics 365 for Finance and Operations. The Service portal module on the Mobile Client allows you to quickly and easily create requests on objects, for example, when a worker detects an error, a faulty setup, or a need for inspection on a machine /work center. This module is intended for shop floor workers who operate machines or other types of equipment, which regularly require maintenance or service. The Service portal ensures that a worker can quickly report faults and errors in your production facility. A maintenance manager or maintenance clerk decides what needs to be done to follow up on the request. *In order to create work orders from a service request, you have to have the Service Portal module. From the Request Management workspace, you can get an overview of all request which are not linked to a work order. To approve a service request you can simply create a work order from the request and they will be linked together. 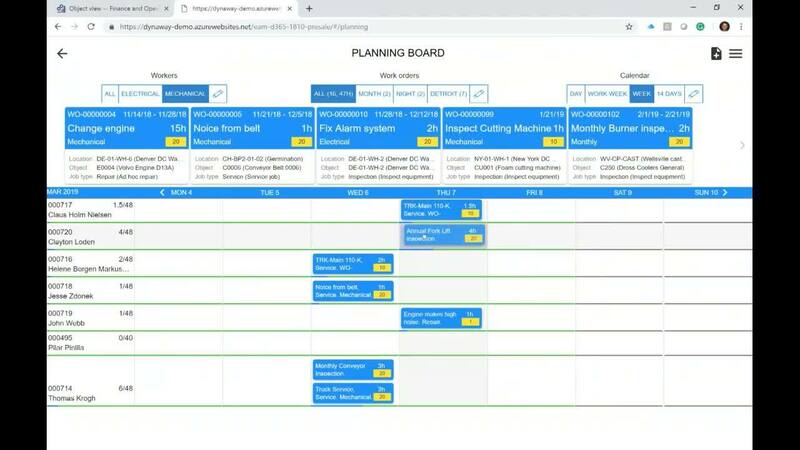 In the mobile solution for Dynaway Enterprise Asset Management, the Planning board module is used for planning unscheduled work order lines on individual workers. Planners, supervisors, and managers can schedule and reschedule work order lines on the Mobile Client. Scheduling is updated in real time. You drag-and-drop a work order line from the unscheduled area to the calendar area to schedule it. Filter the information based on types of workers, work orders. More filters can be applied, for example based on location and work group if you want, for example to see worker on different locations. The Kanban board is used for handling and completing work orders within teams on the Mobile Client. For example, your company may set up teams of workers with different skills to work on specific work orders, or you may have groups of professionals such as electricians, mechanics, or plumbers, which work on the same types of jobs / work orders, or groups may be divided geographically on a site if you have multiple production facilities on one company address. Download our Comprehensive Dynaway White Paper or book a call with one of our sales represenatives! The information you provide us with will help us tailor our assistance as close as possible to your company's inquiries. Our experienced consultants will answer all your questions regarding our services and solutions!